Peas, in addition to containing vitamins and minerals, are healthy sources of vegetarian protein. They also contain plenty of complex carbohydrate, fiber and a small amount of fat. You digest the different nutritional components of peas in different areas of your digestive tract -- and some of the components you don't digest at all. Peas contain some complex carbohydrate -- commonly called starch -- as well as a small amount of simple carbohydrate, or sugar. You start to digest the starch in peas while you're still chewing them; an enzyme called amylase that you secrete as a part of saliva breaks down the starch into its building block molecules, which are called glucose. You continue digesting the starch in your stomach and complete the process in your small intestine. Peas are popular with vegetarians and meat eaters alike because they contain protein, which you use to provide your cells with energy. The building blocks of proteins, called amino acids, also allow you to build your own cellular proteins. Protein digestion begins in the stomach, so it's not until you swallow your peas that your digestive enzymes begin to break down the proteins. Protein-digesting enzymes are called proteases, explains Dr. Lauralee Sherwood in her book "Human Physiology," and both your stomach and small intestine secrete them. Peas aren't as high in fat as some of the other members of the same family, including soy and peanuts. They do contain some fat, however, which you don't begin digesting until your peas reach the first portion of the small intestine, explains Dr. Gary Thibodeau in his book "Anatomy and Physiology." Fat-digesting enzymes, called lipases, depend upon bile salts that your gallbladder secretes into the small intestine in order to function. Peas are also high in fiber, which benefits your health in several ways. Beneficial though fiber is, however, you don't digest it at all. In fact, it's the indigestible nature of fiber that contributes to its health benefits. Fiber helps increase the bulk in your intestine, which keeps you "regular" and makes it easier to move the waste matter from your meals along. Fiber also binds to cholesterol and certain toxins and decreases your risk of colon cancer. Can Lentils Make You Fat? 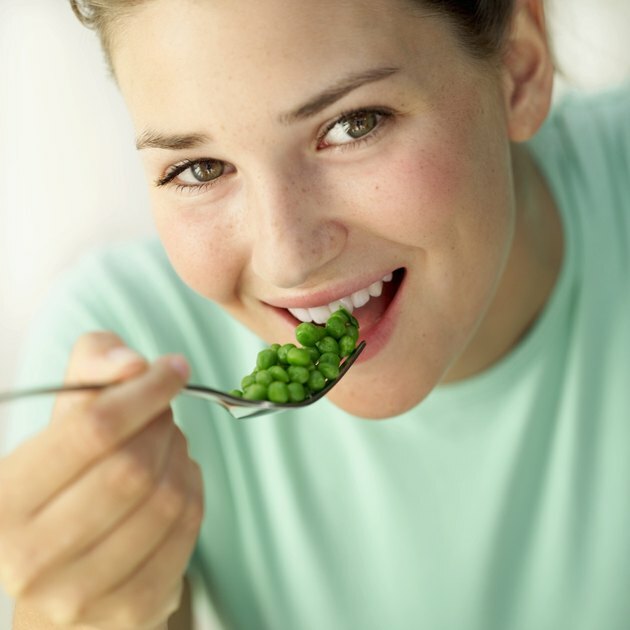 What Are the Benefits of Eating Peas?